Defending champion Michael van Gerwen moved into the second round of the PDC World Championship, but former winner John Part was beaten on the first day. Dutchman Van Gerwen, top of the PDC Order of Merit, hit eight 180s in his 3-1 win against England's Joe Cullen. Canadian Part, who won the PDC title in 2003 and 2008 as well as the BDO crown in 1994, lost 3-2 to Keegan Brown. Spain's Cristo Reyes ousted 13th seed Wes Newton by winning a sudden-death 11th leg in the deciding fifth set. 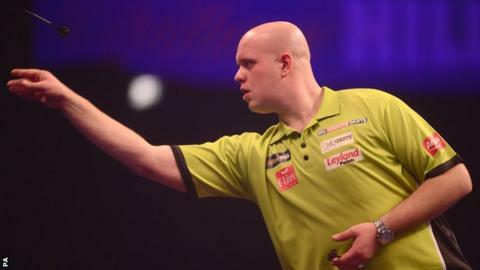 Van Gerwen acknowledged he made "too many mistakes" on the tournament's opening night. The 25-year-old added: "Joe is a fantastic player. I just want to do well and, with all the pressure, I'm happy to just get the win." Isle of Wight based-Brown, who works part time as a lab assistant, was making his debut at Alexandra Palace. "There's no real time to enjoy it," said the 22-year-old after the biggest win of his senior career. "I'll be back at work on Monday morning and I'm working Christmas Day and Boxing Day as well." Brown will face Adrian Lewis in the second round on 28 December, if the two-time world champion beats David Pallett on Tuesday. Two world titles, one champion? Read more on PDC World Championship: Can Stephen Bunting do the double?